Just a little warning before I get started...the music nerdery has been cranked up to eleven on this post. I kinda see myself as a Tokusatsu music historian so this kind of post really gets me riled up. You might dig this post if you share the same kind of love and appreciation for Tokusatsu music as I do, or you might dig it if you like unearthed secrets being brought to light. It is late 1994 and Forte is desperate to strike a deal with Toei to save itself from it's rapidly approaching death. KYOKO is clearly Forte's greatest asset so she is tasked with writing and performing a handful of songs for the upcoming Hakaider film and Choriki Sentai Ohranger. Two songs were written, performed, and released for the Hakaider film, but were left unused in the film itself. Alright, so maybe the Hakaider part of the story turned out...OK... for KYOKO. 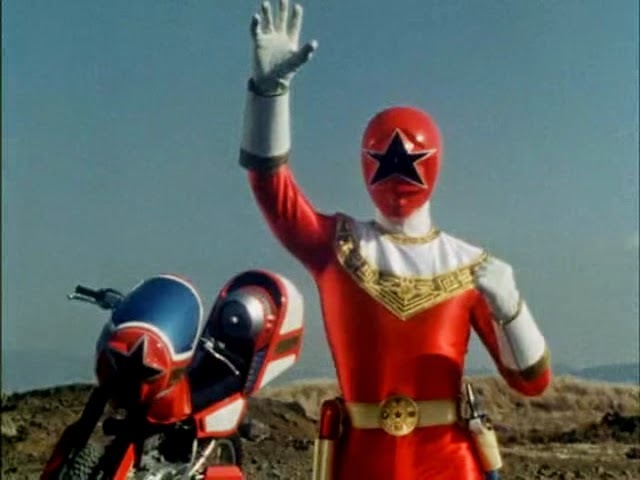 The two songs for Ohranger were destined to be the Opening and Ending theme songs for the series. For the Opening theme, she wrote and composed a new song called Niji Iro Crystal Sky and for the Ending theme a new version of her previous single See You Again would be used. Unlike the two songs from Hakaider, the story of the two Ohranger songs have very different endings. See You Again never made it as Ohranger's ending theme song. It's a shame since I think it's a neat little song...but Kinkyu hasshin! Ohranger is one of my favorite Sentai Ending theme songs. I'm a little bit conflicted with the outcome here. It would've been a fresh sounding change to use See You Again and a label outsider, but Kinkyu hasshin is an awesome song. Sentai has always used songs from Columbia, so maybe using Kyoko's song would've opened up the possibilities for having guest artists drop in for a song here and there. On the flipside, it's no secret that Niji Iro Crystal Sky was originally intended to be the Opening Theme song for Ohranger. It would be easy for anyone at Toei or Columbia to admit such a thing because the song exists as a finished product on an Ohranger CD along with the fact that it is one of the most popular Sentai songs of the 90s. Whether or not it was always intended to be performed by Kentaro Hayami or not remains a mystery. It's also interesting to note that the infamous Saburo Yatsude would've magically gotten credit for writing the song had it become the show's theme song. In the end, Forte's collapse might have played a hand in the inability for 3/4 of these songs to go anywhere--the label was dead a few months after Ohranger's debut. Things probably worked out best for everyone involved in retrospect, but you can't help but feel bad for Kyoko's inability to actually put her voice in a theme song to Hakaider or Ohranger. As a little note to this post, I did a little bit of research before I set out to write this. 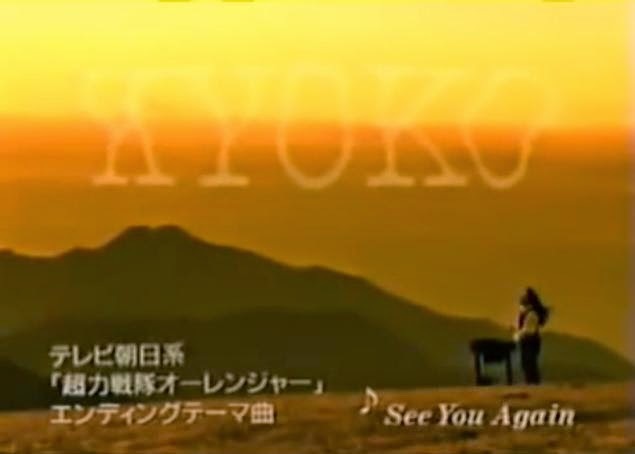 On niconico I found this video for See You Again which features it being used as an opening song. The uploader also tacked on the commercial that I saw on my VHS. Further digging lead me to this video on Youtube, which features the opening and ending videos recut with Niji Iro Crystal Sky and See You Again respectively. I'm not sure how I missed the latter video, but it would have made it much less of a surprise when I caught the commercial on the tape I was watching. Oh yes, and I now notice that Kyoko's wikipedia page makes mention of this who debacle at the bottom, yet the Ohranger wikipedia page makes no mention (but it does mention all of the random JPop songs used during the show......future blog post perhaps...?). Anyway, I've typed enough. I hope your mind is sufficiently blown. Let me know what you think in the comments or hit me up on Twitter. P.S. As of this writing I'm not entirely sure where my copy of KYOKO Sound Laboratory's See You Again is. Sorry for the lack of pictures and a better quality rip of the song--I'll have to hunt through my boxes of CDs to find it when I get some time. Also, are you surprised that I actually owned the album already? Yeah, me neither. In the meantime I uploaded the song to Youtube. Give it a listen! I guess this makes it “Part 3” for Forte entry. That's a very interesting and "dramatic" story you shared there. I knew about "Niji Iro Crystal Sky" was intended to be the OP. I found out few years ago on some site (I forget where). Personally, I wouldn't mind using that as OP since it was sang by same singer, Kentaro Hayami, but it doesn't have dynamic and epic we got at the end. It was very nice that it was used in final episode. As for "See You Again", this was new for me. I had no idea that this song existed. Personally, as a standalone song it’s fine, but it just doesn’t fit the atmosphere of the show IMO. I’m glad that Kinkyu hasshin! Ohranger was used, since it’s an awesome song. Maybe it might work well with other sentai; I can’t think of which one, but it might sound well with Timeranger (yeah, sounds too random. LOL). It’s such a shame that this song was never included in any sentai albums. It would have nice to labeled as “song that was originally intended for OP” or “Abandoned Song” or something. Regarding Wikipedia… it’s never been too reliable for “niche” information (…OK, maybe sentai is not that niche). Plus, anyone can edit/change facts and info there. One last thing… ONORE FORTE!!!! I kinda wish we were living in the alternate reality where See You Again made it as the ending song. It would have made the 90s a little more diverse music-wise. As-is Ohranger's song collection is rather anemic, so the more the merrier. The only problem I would see is the fuckpoop that Kamen Rider music has become under avex. I was trying to be as transparent as possible in my research by mentioning the Wikipedia entry for Kyoko Kiya. I know it isn't reliable, which is why I didn't really bother mentioning what else it said in the entry about her two Ohranger songs. It says that in some Karaoke software, See You Again and Niji Iro Crystal Sky are still listed as the Ohranger theme songs. So basically, yes, I know Wikipedia isn't a source. I had a handful of web sources before I even checked there. I just want to avoid anyone saying "Hey, it mentions it on her wikipedia entry too!". Can't hurt being too thorough, no?